3/4" x 1 3/4". sterling, copper, brass, semi precious stones, sterling chain, sterling posts. light and fun. approx 2 1/2" long including ear wires. copper, brass, sterling, semi precious stone. 2 1/2" long including ear wires. copper, brass, sterling with semi precious stone. lightweight. approx 2 1/2" long. brass, copper, sterling. lightweight. about 2" long. copper, brass, sterling. mixed finishes. sterling posts. 2" long. mixed sterling rings. sterling posts. approx 1 1/2" long. sterling, brass, copper, sterling ear post. approx 1 1/4" long. sterling, brass, sterling posts. approx 7/8" long. sterling, brass, copper. sterling ear posts. 1 1/4" long. sterling, brass, copper, semi precious stones, sterling posts. approx 2" long. 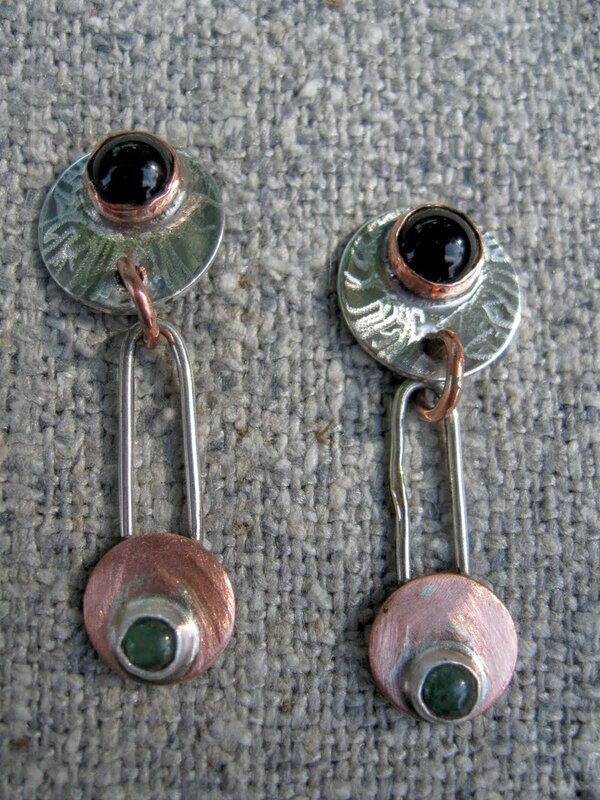 copper, sterling, semi precious stone, sterling ear posts. approx length is 1 3/4". 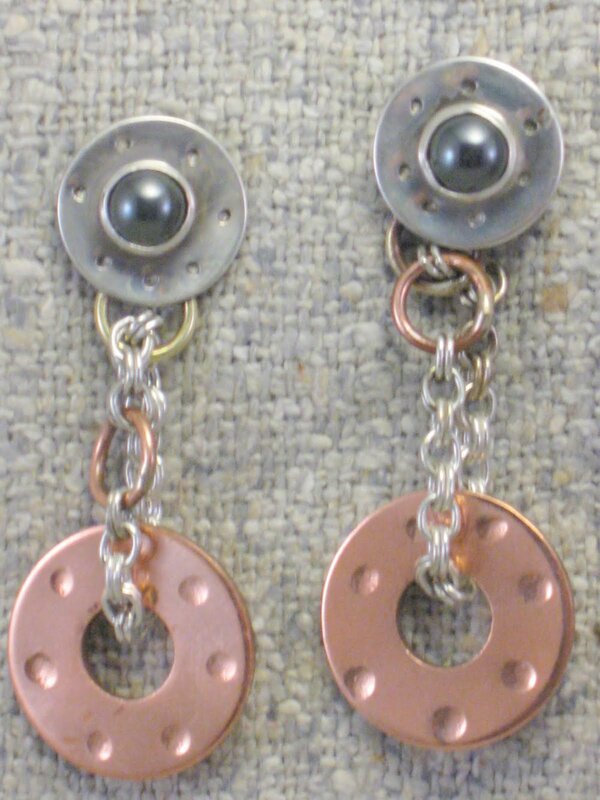 1/2" sterling top disk, copper washer, jump rings and chain, sterling posts. 1 3/4" long. sterling, brass, copper, semi precious stones, and sterling ear posts. 1 3/4" overall length. 1/2" sterling disk with semi precious stone dropping a variety of mixed metal rings and a small sterling bead. 1 5/8" long. sterling, brass,copper, and semi precious stones with sterling ear posts. 1 /3/8" long including sterling hoop. sterling, copper, brass, semi precious stone. 2" long, 3/4" top diameter. sterling, copper, brass, semi precious stone with sterling posts. approx1 3/4" long. brass, copper, silver, semi precious stones,and sterling posts. 2 1/2" long. copper, sterling, brass, semi precious stone, sterling post. this is one of my earliest earring designs. 2 3/8" long. sterling, copper, brass. semi precious stone, and sterling post. this earring is also nice with the pieces reversed! 2 3/8" long. sterling, copper, brass, semi precious stone, sterling ear posts. 2 3/4" long including ear wires.brass, sterling, copper, semi precious stones. light weight. 5/8" x 1 1/4" long. sterling, copper, semi precious stones, sterling ear posts. 3/4" diameter. 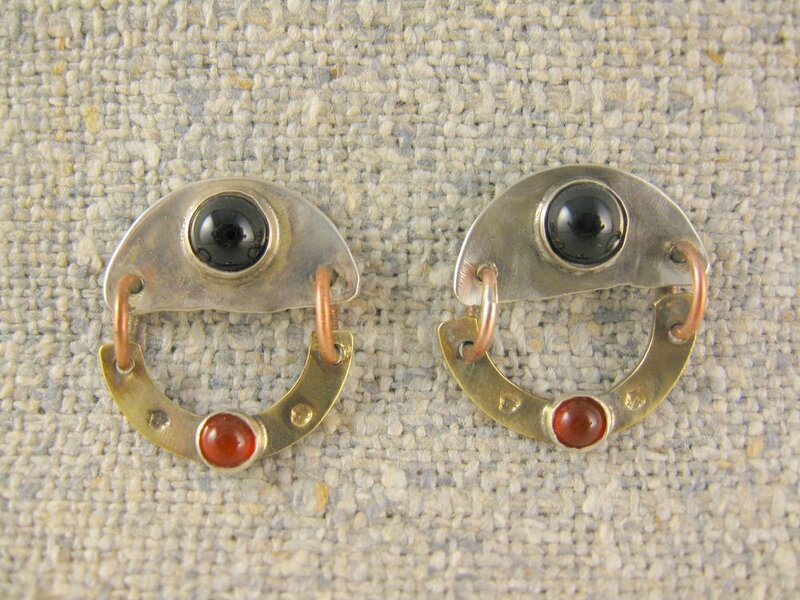 sterling ovals, mixed metal pierced rings, semi precious stones, sterling posts. 3 1/4" long. marked cut sterling top 1" sq. top piece. mixed shapes, sterling chain, and semi precious stones enhance the earring. these earrings can be scaled down in size if desired. approx2 3/4" long. copper, brass, sterling, sterling ear posts. 3/4" diameter. sterling disk, brass washer, brass washer, semi precious stones, sterling posts. 7/8" diameter. sterling, brass, copper, semi precious stones, sterling chains with metal tubing. 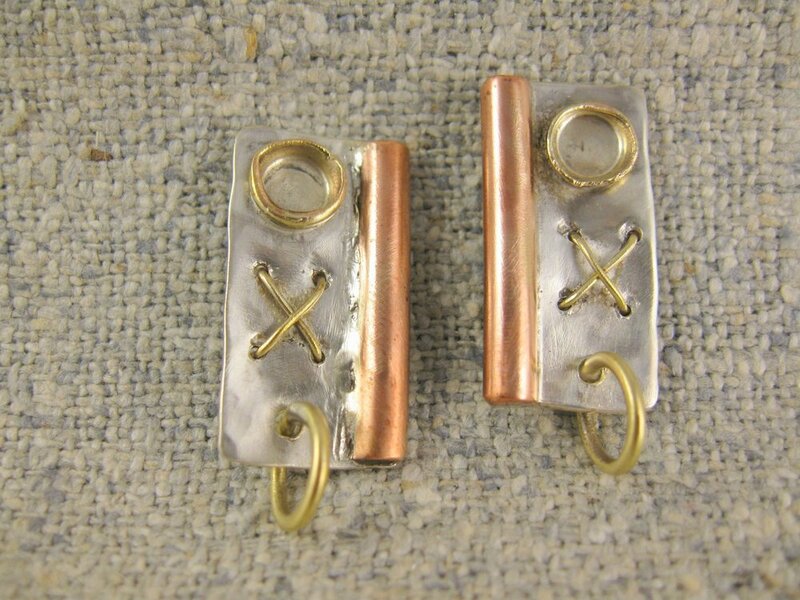 3/4" sterling domes, copper wire outline, brass hearts, sterling posts. 1/2" domed sterling squares. brass outlines with brass hearts and sterling posts. 3/4" x 1 1/8" long. sterling, brass, copper, semi precious stone, sterling post. 5/8" x 1 3/8" long. sterling, copper, brass, semi precious stone, sterling post. 1 7/8" long including ear wires. hammered 3/4' brass disk, brass outline, copper rivet with copper ring and dangle wire. 1 3/4" long. 3/4" hammered sterling top piece joined with brass to drop copper washer adorned with silver ring set with semi precious stone. sterling silver post. approx 2 1/4" including ear wire. 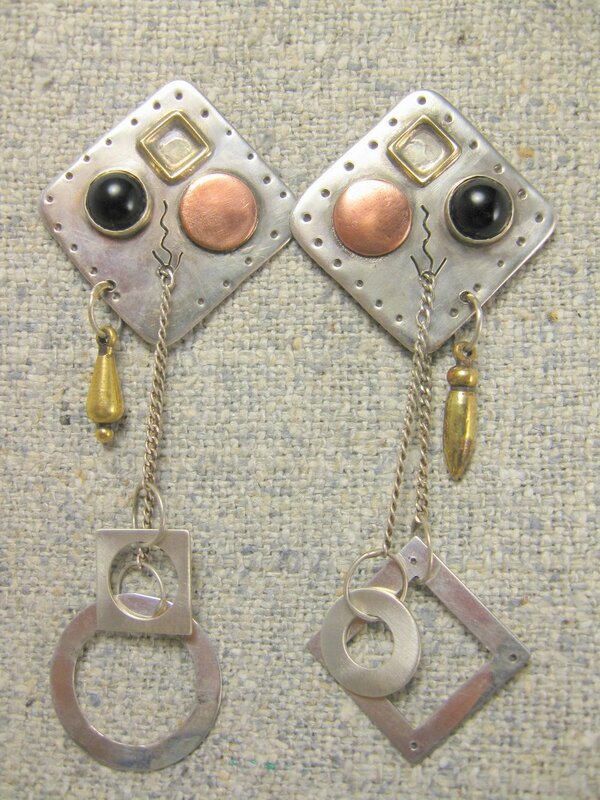 copper, sterling chain, sterling bezels and semi precious stone. 1 3/4" overall length. 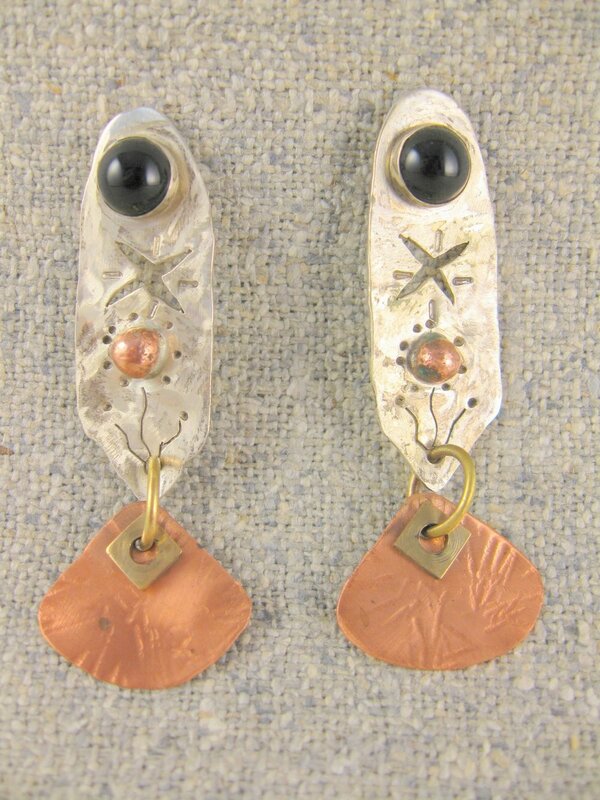 semi teardrop shaped copper drop riveted, and pierced with sterling jump rings. semi precious stone and sterling ear hoop. 7/8" x 15/8" long. sterling, with mixed metal links and semi precious stone. sterling ear posts. 1 1/4" overall height. sterling, copper rivet, brass ring, semi precious stone, and sterling ear post. 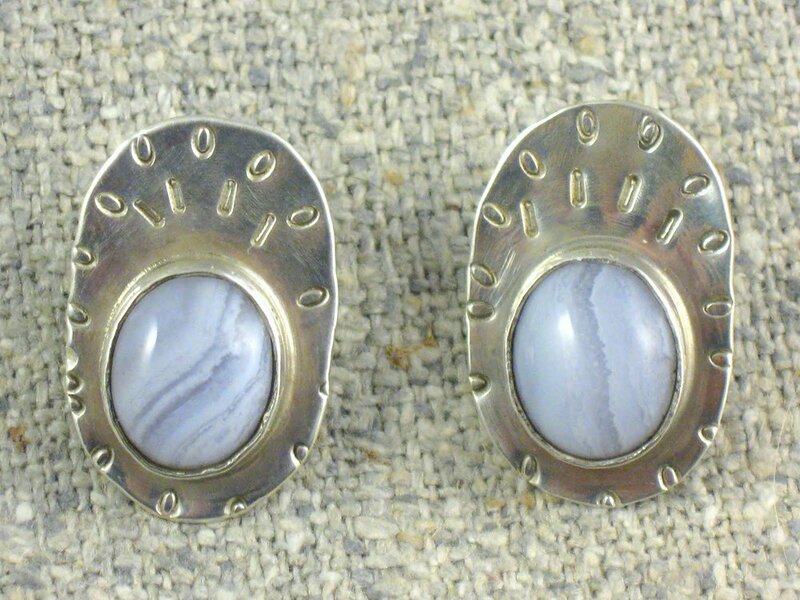 5/8" x 1" marked sterling irregular ovals with semi precious stone and sterling ear posts. 3/4" sterling marked disks with black onyx. sterling ear posts. 1/2" squares. sterling, brass, semi precious stones. sterling posts. 3/4". sterling, semi precious stone, sterling posts. approx 5/8". reticulated silver with a semi precious stone. sterling posts. 7/8" reticulated sterling, oxidized brass heart and sterling posts. approx 3" including ear wire. sterling, brass, copper, semi precious stone. fairly light weight. approx length is 2 1/8". sterling, brass, copper, semi precious stone. 3/4" diameter sterling half circles with mixed metal rings dropping mixed irregular circles, sterling ear posts. these are very light weight. 1" diameter marked sterling disks.copper domes, copper stitches, semi precious stone, sterling posts. ( hard to photograph! brass is more golden!) approx 2 1/2" long. sterling earwire.. lightweight for a long earring. brass hammered oval with 8mm semi precious stone. copper rings, and frosted sterling silver ring. 1 3/4" approx length with ear wires. sterling, copper, semi precious stones. 1 1/2" approx length. sterling, copper, brass, semi precious stone. approx 1" long. copper, brass, sterling, semi precious stone and sterling posts. approx 1 5/8" long. back rivets connecting sterling, copper, and brass. semi precious stone. sterling ear posts. approx 1 3/4" long. sterling, copper, semi precious stone, and sterling ear posts. approx 1 1/2" long. sterling, brass, copper, semi precious stone, sterling ear posts. approx 1 7/8" long. sterling, copper, brass,semi precious stone, sterling ear posts. 1 1/2" long. 1/2" marked sterling sterling disk from which hangs a copper ring holding another smaller copper disk with a second semi precious stone. lightweight. approx 1 1/8" long. sterling, semi precious stones, sterling ear posts. 9/16" x 1 1/4" long. 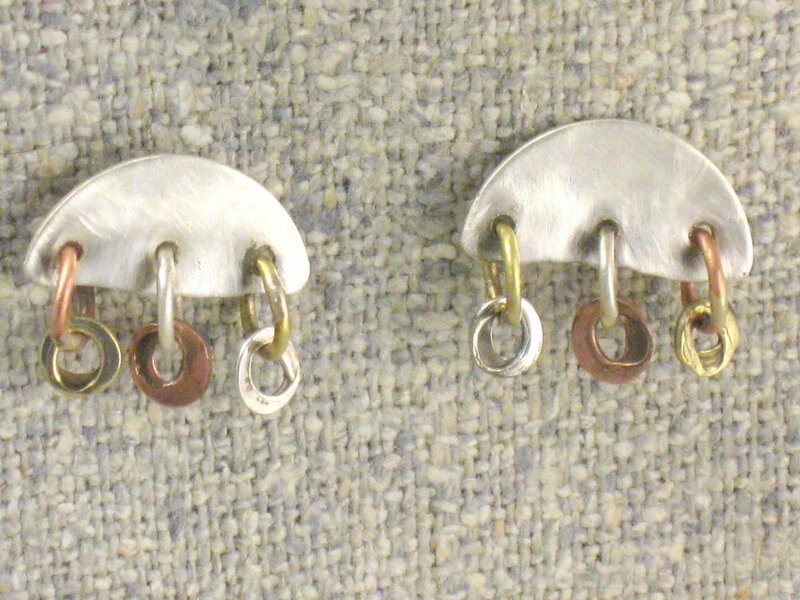 sterling, brass, copper with sterling ear posts. 2 1/2" including ear wire. 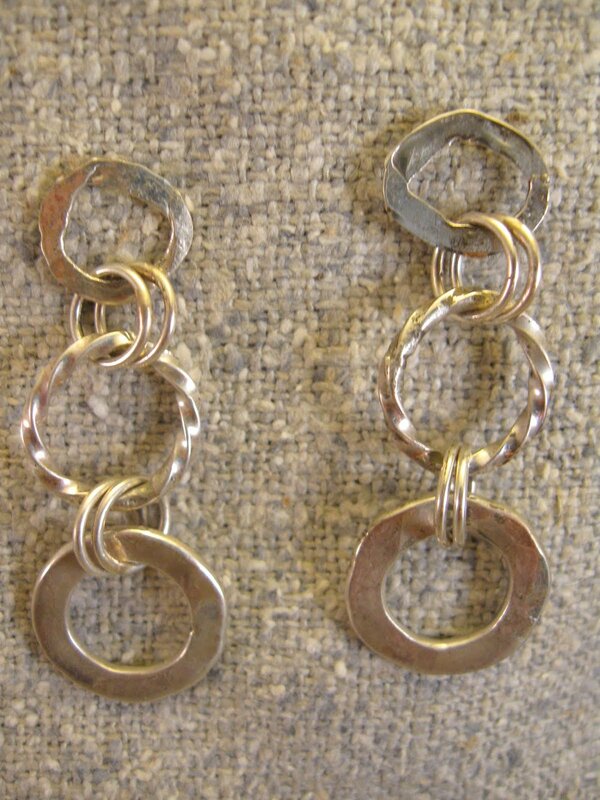 sterling rectangle with copper X stitch, and brass hammered oval links. 1 1/4" long. sterling, copper, brass, semi precious stone and sterling post. 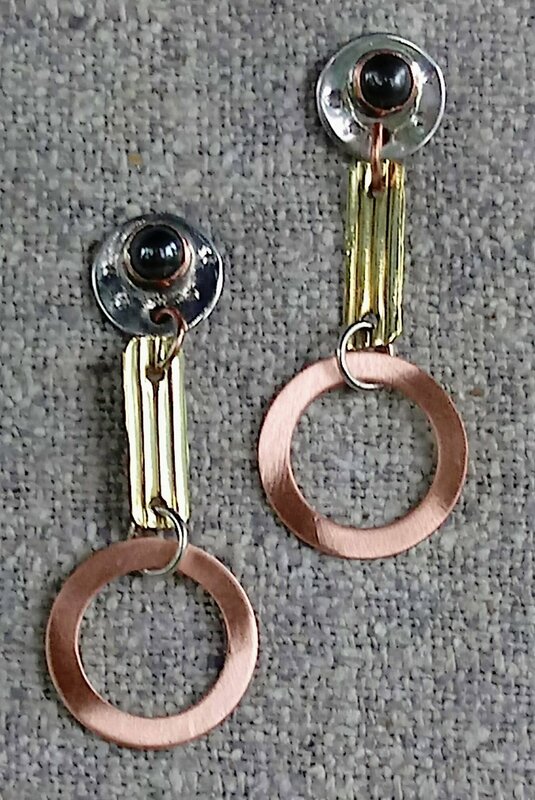 1 1/4" copper and brass with sterling stitches and sterling dangle wire.